Rijeka is in an exceptional location, at the point where the Adriatic Sea has entered the European coast furthest inland, and that is why the rich history of this city is tied to the sea. Rijeka is the third largest town in the Republic of Croatia, and is the main town of Primorsko-Goranska County. Because of its openness towards the outside world, the city is known for its hospitality. 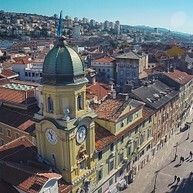 The influences of numerous cultures and nations can be seen in the town, and Rijeka has to this day remained a town of tolerance and coexistence. Opening hours: Shops in the city centre are open from 8 am until 8 pm, on Saturdays and Sundays they are mostly open until 1 pm. In the city centre there are several pharmacies which usually stay open 24/7. After 8 pm, cigarettes and newspapers can be bought in the only kiosk that works 24/7 located at the Bus station, on Žabica. You can purchase all you need in one of the larger commercial centres in Rijeka. City market, the famous “Placa”, is open every day until 2 pm and on Sundays until noon. Rijeka is a bustling, cosmopolitan town characterized by its fabulous history, its cultural edge and its waterborne leisure. Check out what Rijeka’s history, culture, heritage, nature have to offer… what is worth a visit while you’re here and what you will remember Rijeka by. Rijeka is reflected in Korzo, at Korzo you can read Rijeka. Anyone who, at least once, had a coffee at one of the terraces of numerous and picturesque café bars lined along this unusual promenade, would agree. City Tower, a symbol of Rijeka and a good example of a typical round tower access-point, which lead into the fortified town. Today it dominates the central part of Korzo, although during its lifetime it was overtopped by more recently constructed buildings. St. Vitus’ Cathedral is the only Baroque rotunda of monumental proportions built on Croatian soil. 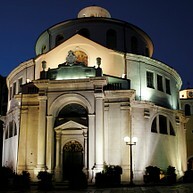 The construction of this church, designed by the Jesuit architect G. Briano, began in 1638. It was made on the model of the famous Venetian church of Santa Maria della Salute. The location selected for the construction of the St. Vitus’ church was an elevated area at the heart of the then still medieval urban tissue. Initially, there was a small church of the same name, dedicated to the city's patron saint. The Jesuits, as the creators of the project, primarily decided to use the cult of the Miraculous Crucifix from the small church, which, according to popular legend, started bleeding when a certain Petar Lončarić threw a stone at it after exploding with rage over a gambling loss. The early Gothic crucifix is incorporated into the Baroque main altar of the new church, which, in the spirit of storytelling piety inherent to miraculous relics, also houses Lončarić's stone and a small bronze hand. 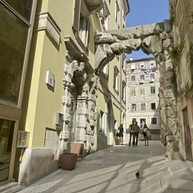 The Old Gateway or Roman Arch is not a Roman triumphal arch, as was once presumed, but a representative main entrance to the centre of the Late Antique command compound of the Roman Tarsatica, an ancient town on whose ruins the medieval Rijeka was built. Rijeka’s common people were right in calling this ancient monument simply the Gateway, while the name Roman Arch has been gradually accepted since Classicism, when it started to be documented and researched. Those who peek into Rijeka’s computer museum and poke through its past will be amazed by the speed at which our technological future has become our past. 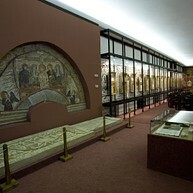 The museum has over 2000 exhibits of international and Croatian computer, audio, video and photo technology. The first Croatian museum dedicated to childhood, games, books and toys loved by many generations before they "decided" to become all grown up and serious. The Childhood Museum offers more than 600 exhibits among which the oldest toy dates back to 1900. It is thematically divided into the Creation Park, Fossil Zone, Social Circle, Advertising Passage, Book Corner, Doll Empire, Sand Arena, Street Call and In Front of the Screen. The museum is headquartered in the former Governor's Palace, a historicist edifice and protected cultural monument. The Governor's Palace was constructed in 1896 and designed by Alajos Hauszmann, one of the foremost Hungarian architects during the time when Rijeka was under Hungarian rule. Today, the palace houses the Maritime and History Museum of the Croatian Littoral, which was established in 1961 and comprises maritime, historical and cultural, ethnographic and archaeological departments. Some of the original items from the Governor's Palace, such as furniture and artisan craft-work, have been preserved and exhibited in salons on the first floor. The permanent exhibition of the museum provides an interactive and modern platform for showcasing the long, rich and tumultuous history and culture of living in the area of what is today Primorje-Gorski Kotar County from prehistoric times to the present day. We all know that a city without its own museum is not a city. Rijeka’s City Museum awaits its visitors in the Governor’s Palace Park. The activity of this institution can be seen in various areas of activity, including collecting, treatment and restoration, research of the city’s (and not only the city’s) past and organising exhibitions on important historical themes. The Museum is oriented towards marine research and has a specialised library in the field of biology, geology and palaeontology. Visitors can enjoy the rich collections and permanent exhibition representing the geological past of the Adriatic, oceanographic research, minerals, marine invertebrates, sharks and rays, the “Aquarium” multimedia centre and reptiles and amphibians from the Rijeka area. The Museum is working on a number of collections. These are collections of works by national artists Božidar Rašica, Romolo Venucci and Slavko Grčko, as well as collections of drawings, graphics, sculptures, posters, paintings, photographs and media art. 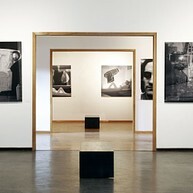 The exhibition activities take place in Krešimirova Street as well as in the Mali salon, on Korzo. 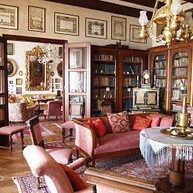 The main part of this collection is Ivan Mažuranić’s library and his archive. The manuscript of Gundulić’s epic poem, Osman, from 1647 is stored here, a gift from Petar Petrović Njegoš. The library has eight thousand books and the archive with two thousands volumes. In 1947, the villa received the status of monument heritage. The symbol of the collection is the ring of Smail-aga Čengić, the main character in Mažuranić’s epic poem of the same name. The Glagolitic alphabet exhibition in the University Library is a permanent exhibition with 127 items, each telling a story about the extensibility and importance of this alphabet in both Croatian and European cultural history. The alphabet was created in the 9th century and was dedicated to the Slavic peoples; its creators were Constantine (known as Cyril) and his older brother Methodius.